Amazing! Always a good time with Cabins USA!! Our cabin was everything and more!!! The staff was very helpful when we had issues with the WIFI.. The cabin was clean and in excellent condition. We were close to everything we wanted to do. Can't wait to come back!! This was our first time renting a cabin in Pigeon Forge area and we really enjoyed it. Easy to find, clean, well equipped for what we needed in the kitchen, plenty of room and a short drive to the parkway. The cabins are close but out on the decks, you are still secluded with privacy. You don't see your neighbors on each side of you but you do have a view of the ridge. We LOVED the hot tub on the deck. We stayed on the deck, more than on the inside. We will be renting it again on the next trip. We stayed at Radiant Ridge the week of Christmas and it was wonderful. The cabin was very nice and comfortable for our family of 5. The location of this cabin was very easy to get to and not far from the parkway. I loved express check-in and out it was so easy and the staff gave a complimentary phone call to make sure all was to our satisfaction. I will most definitely use Cabins USA again. The location was perfect! About 5 mins from everything. Easy to get to after the first trip I no longer used GPS because it was a straight shot basically. The view was AMAZING especially when it snowed! I enjoyed this cabin overall.. very clean and convenient. When I initially booked the cabin, the balance came out of our account instead of the deposit. I sent an email and 2 days later it was reversed. I never received an email or a call acknowledging the issue. So I was a little bothered that unexpected funds came out our account and the booking process. This is my 2nd time staying with Cabins USA and didn't have this issue the first time. Fast forward to our trip, loved the express check in process. I was glad that we didn't have to go to the office. The cabin was cozy and very roomy. The view out back is amazing. I would have preferred blinds on the back windows upstairs and downstairs. There are no cabins behind this one except one at the very top of the mountain. It took a little getting use to not having blinds. It was easy to get to the main strip. All in all, we were happy with this rental. 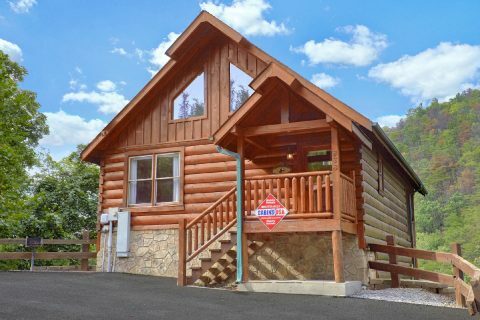 Excellent stay, great cabin in a convenient location to Pigeon Forge and surrounding area. Went to Gatlinburg many times during our stay, only took about 20 mins when the traffic wasn’t crazy. Within minutes of our arrival, we saw a bear off of the porch in the back in the woods. Beautiful views, quiet and serene. Hot tub was nice after our 4 hour hike through the smokies to Rainbow Falls. Definitely will recommend this property to friends, already thinking about my next trip to Tennessee. We stayed at Radiant Ridge for 3 nights (Oct 11, 12 and 13) and we thoroughly enjoyed our stay. Staff was helpful and friendly. I was able to make payments online via the chat feature every month so the stay would be paid in full before I arrived. The cabin was spacious and had nice features. We enjoyed the hot tub, the fire place, the pool table and the arcade game. The view from both balconies was nice. You’re right at the beginning of the resort and you are literally 5 minutes from the parkway where the Island is. Couldn’t be more convenient but with the secluded feel. The complaints were nothing that would deter us from staying again but were bothersome. The bathroom on the main floor has only 1 working light bulb so it was extremely dark. The mattresses are definitely soft so if you prefer a firm mattress like we do you’re out of luck. The pool sticks are very used and there’s nothing left to them but they still work to play around. Even though we stayed in mid Oct and it was cool outside, it was warm and uncomfortable at night when you were trying to sleep due to zero air flow. A very friendly company and a family friendly convenient cabin. Thanks Cabins USA! We really liked the cabin. We enjoyed the hot tube and old school video games. Make note on the website that the grill is charcoal. I had to make a second trip to buy charcoal. More spare garbage bags. We only had the one in the can. Improve the cable. The cable was so basic we couldn’t watch anything. Didn’t even have HGTV. After a day of hiking, we wanted to relax and watch football. No ESPN, so no football. Often we have friends and family that come up in the Fall. The women shop & the men hangout and watch football. This could prevent rental opportunities. We loved this cabin!! The location is fantastic--close to the parkway and to the national park. The view couldn't be better, and it is easily enjoyed from anywhere in the cabin because of all the windows. We had an issue with the back door that was quickly resolved by a wonderful gentleman from maintenance. The cabin was very clean and very comfortable. We highly recommend Cabins USA, and we look forward to staying here again!! The cabin was great. I would suggest maybe having living room furniture changed as it’s kinda wore in. And mattress is kinda wore in also. Other than those few things, I would recommend staying with your company again. We stayed in Radiant Ridge. Beautiful cabin. A/C worked very well. The scene from the balconies were just delightful. I would recommend this cabin to any family. The cabin was very clean and no bugs/pests. This is a 2 floor cabin. Steps in between. Wifi worked very good. Keep in mind, you are only provided with starter things like laundry detergent, dishwasher detergent, paper towels, hand soap and toilet paper. Be sure to bring backup. There is no complimentary shampoo, conditioner or toothpaste etc. The washing machine dial is very hard to turn but the washer does work. The arcade game works but make sure you read the instructions posted on the side of the game. (My 15 year old figured out how to work the arcade game but it was very challenging). You don't have too many TV cable channels but there is Netflix. The main balcony door does not open/shut easily. The kitchen is stocked with pots/pans but there are no spices (salt/pepper etc). There are dishes there but we brought our own paper plates and paper cups. There are towels provided. Overall a great experience. We will return again. I really enjoyed the stay,the scenery was beautiful.My kid were kind of disappointed cause the game didn't work and neither did some of the cable on the TV's but over all it was ok. Thanks again for a wonderful stay! We will be back! First, I cannot say how happy we were with Radiant Ridge! It exceeded our expectations. The view was great! The cabin was clean, aside from normal cabin life things like Asian beetles (boy were they annoying). Everything we needed was supplied and we had an issue with the heat/ac but maintenance came right away and fixed the issue. The kids had a blast with the video games and pool table and the hot tub heated up quickly and stayed hot our entire stay. The road wasn’t too difficult to find and our driveway was easy to get to. We so loved the cabin and our stay. Highly recommend this cabin for a family of 6! Secondly, I have to say I was very nervous when booking. I read reviews and try to choose based on others reviews and I am so glad that I didn’t listen to the negative reviews regarding Cabins USA. I have nothing negative to say about the company and will for sure rent from them again! A++!! WE ENJOYED THE CABIN.WE NOTICED THAT THERE WAS VERY LITTLE CHALK FOR THE CUE STICKS THAT SHOULD BE CHECKED AND SHOULD BE STOCKED IN THE CABIN.THE BED DOWNSTAIRS WAS NOT AS COMFORTABLE AS THE ONE UPSTAIRS IT SHOULD ALSO BE A KING INSTEAD OF A QUEEN SIZE BED. OUTSIDE LIGHT NEEDS TO BE BRIGHTER. WE HAD A GOOD TIME AND WILL BE BACK. ALBERTA J.